Cooking chicken in San Miguel has been raised to a fine art. The majority of cooked chicken sold is called Pollo Rostizado - spit broasted chicken, seasoned with a secret blend of herbs and spices. It is sold in chicken restaurants and carry out stands all over town. The best known is Pollo Feliz (Happy Chicken....go figure) that is kind of the local KFC. 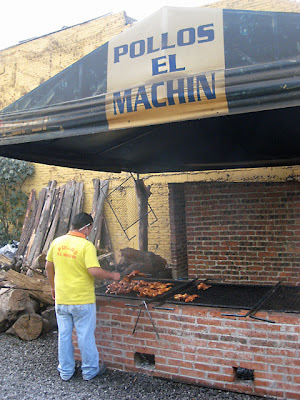 However, the chicken I prefer is cooked over a grill fired by mesquite wood, and is called Pollos El Machin, which roughly translates as "The Macho Guy's Chicken." 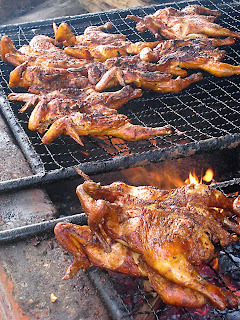 It is also referred to as Pollo asado, or barbecued chicken. One of the owners is Victor, shown below at the grill, where he spends six days a week. He certainly must be a macho guy, to spend all day over a hot, smoky grill! El Machin is next to the bus station, and one often finds bus drivers in the tent, eating a quick meal before their run. El Machin's chicken is drier than broasted chicken, although still plenty moist. It has a delicious mesquite flavor that I have tasted nowhere else. Victor is very proud of his chicken, and says that he uses a much higher quality of chicken than Pollo Feliz. It shows...or tastes! 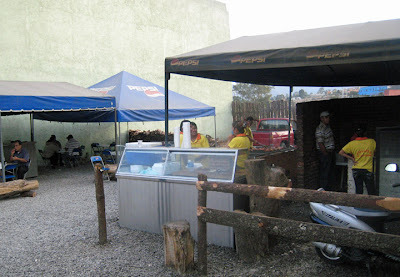 The downside of El Machin is its location - outdoors and far from the center of town. Also, because the cooking is done under a tent, a cloud of (deliciously) scented smoke surrounds the restaurant. Most gringos aren't aware of its existence, and since El Machin doesn't deliver, Americans are denied the pleasure of sampling El Machin chicken. Only a lucky few know about it, including us, our friends, and a fellow from the Culinary Institute of America, who I ran into a few weeks ago! 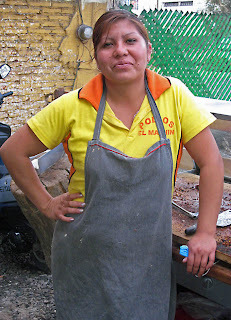 The staff on weekends includes about eight people, who take orders, cook the chicken, make tortillas, salad and salsa, quarter the chicken, and package it to go or to eat under the two palapas (tents). For the first time today, some of the staff were wearing masks. When I asked Victor about them, he explained that it was to protect the staff from the smoke. I guess it would be tough for the customers to wear masks while eating the chicken! After I had been at the restaurant for a while, and the staff realized that I knew Victor, and therefore was about a half rung above the typical gringo loco (crazy gringo), they began to speak to me and pose for the camera. 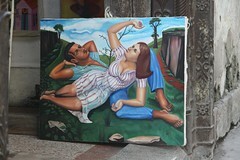 Guadaloupe (Lupita) chose the picture below for the blog. Note the sultry pose. She thought she looked pretty hot in it. I certainly agree. I'm hoping that with all the publicity and business that I am generating for El Machin, one day I will be issued an official yellow El Machin shirt. I'm crossing my fingers!